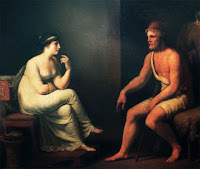 Orpheus and Eurydice story is an ancient greek tale of desperate love. Orpheus fell deeply in love with and married Eurydice, a beautiful nymph. They were very much in love and very happy together. 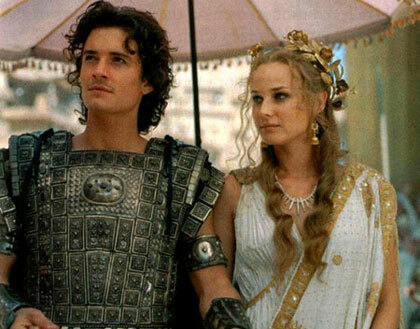 Aristaeus, a Greek god of the land and agriculture, became quite fond of Eurydice, and actively pursued her. 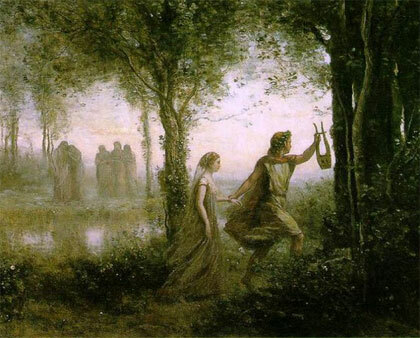 While fleeing from Aristaeus, Eurydice ran into a nest of snakes which bit her fatally on her legs. Distraught, Orpheus played such sad songs and sang so mournfully that all the nymphs and gods wept. On their advice, Orpheus traveled to the underworld and by his music softened the hearts of Hades and Persephone (he was the only person ever to do so), who agreed to allow Eurydice to return with him to earth on one condition: he should walk in front of her and not look back until they both had reached the upper world. In his anxiety he forgot that both needed to be in the upper world, and he turned to look at her, and she vanished for the second time, but now forever. 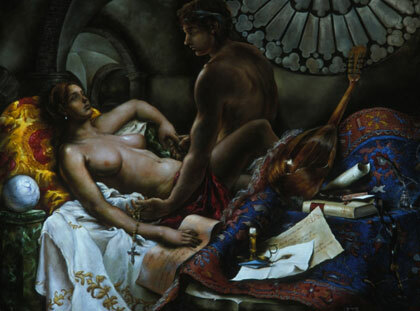 Paolo and Francesca are made famous by the Dante's masterpiece "Divine Comedy". It is a true story: Francesca is married with Gianciotto Malatesta an awful person, but she has Gianciotto's brother, Paolo, as lover. The love between them grows when they read together a book (according to Dante) about Lancelot and Guinevere. When the two lovers are discovered they are killed by Gianciotto. "Gone with the wind" can be identified as one of the immortal pieces of literary works in this world. 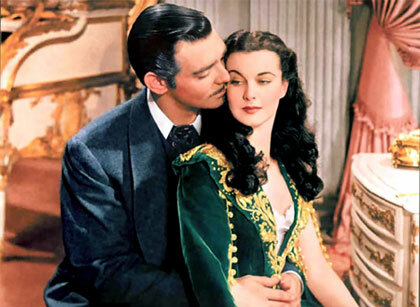 Margaret Mitchell's famous work has chronicled the love and hate relationship between Scarlett O'Hara and Rhett Butler. Proving that timing is everything, Scarlett O'Hara and Rhett Butler never seem to be quite in synch. Throughout the epic story, this tempestuous twosome experience passion but not permanence, and their stormy marriage reflects the surrounding Civil War battles. The flirtatious, promiscuous, and perpetually pursued Scarlett can't make up her mind between her many suitors. When she finally decides to settle on being happy with Rhett, her fickle nature has already driven him away. Hope springs eternal in our devious heroine, however, and the novel ends with Scarlett proclaiming, "Tomorrow is another day." 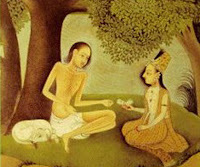 A leading medieval poet of Iran, Nizami of Ganje is known especially for his romantic poem Layla and Majnun Inspired by an Arab legend, Layla and Majnun is a tragic tale about unattainable love. It had been told and retold for centuries, and depicted in manuscripts and other media such as ceramics for nearly as long as the poem has been penned. Layla and Qays fall in love while at school. Their love is observed and they are soon prevented from seeing one another. In misery, Qays banishes himself to the desert to live among and be consoled by animals. He neglects to eat and becomes emaciated. Due to his eccentric behavior, he becomes known as Majnun (madman). There he befriends an elderly Bedouin who promises to win him Layla’s hand through warfare. Layla’s tribe is defeated, but her father continues to refuse her marriage to Majnun because of his mad behavior, and she is married to another. After the death of Layla’s husband, the old Bedouin facilitates a meeting between Layla and Majnun, but they are never fully reconciled in life. Upon death, they are buried side by side. The story is often interpreted as an allegory of the soul’s yearning to be united with the divine. 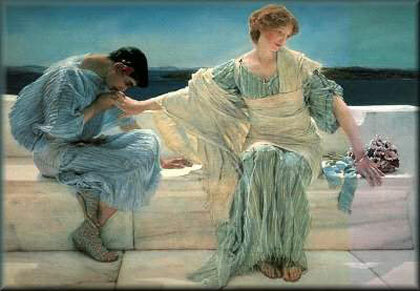 A very touching love story that is sure to move anyone who reads it is that of Pyramus and Thisbe. Theirs was a selfless love and they made sure that even in death, they were together. 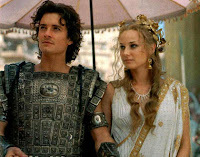 Pyramus was the most handsome man and was childhood friend of Thisbe, the fairest maiden in Babylonia. They both lived in neighboring homes and fell in love with each other as they grew up together. However, their parents were dead against them marrying each other. So one night just before the crack of dawn, while everyone was asleep, they decided to slip out of their homes and meet in the nearby fields near a mulberry tree. Thisbe reached there first. As she waited under the tree, she saw a lion coming near the spring close by to quench its thirst. Its jaws were bloody. When Thisbe saw this horrifying sight, she panicked and ran to hide in some hollow rocks nearby. As she was running, she dropped her veil. The lion came near and picked up the veil in his bloody jaws. 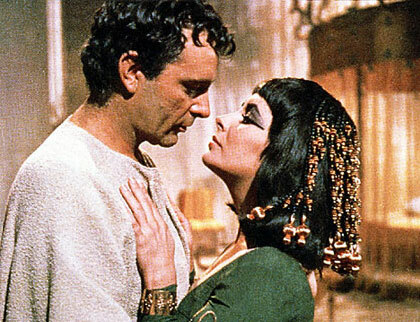 At that moment, Pyramus reaches near the mulberry tree and sees Thisbe's veil in the jaws of the lion. He is completely devastated. Shattered, he pierces his chest with his own sword. Unknown to what just happened, Thisbe is still hiding in the rocks due to the fear of the lion. When she comes out after sometime, she sees what her lover did to himself. She is totally shattered when she sees the sword piercing right through her lover's chest. She also takes the sword and kills herself. Actually Jane Austen has personified two attributes of human nature, pride and prejudice in Darcy and Elizabeth. Darcy comes from a very high social hierarchy and Pemberley. He typifies the educated aristocracy while on the other hand, Elizabeth is the second daughter of a gentleman of modest means. 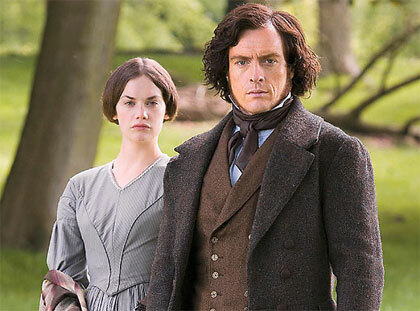 Mr. Bennett has five daughters who have been allowed to grow up the way they wanted, there has been no school education for them, nor has there been any governess at home. Elizabeth’s very indulgent mother and irresponsible father never gave any thought to the future of the daughters, it is always taken for granted, that they will do well for themselves. To a woman of Mrs. Bennett's understanding, doing well exclusively means finding a rich, well to do husband. For a man of Darcy's social stature, these were very serious failings of the family and totally unacceptable to his polished, educated and refined mind. Darcy adores Pemberley, and the future mistress of that estate can only be just as polished and refined and from an equally prestigious family. He falls in love with Elizabeth only to be refused by her initially, and then much later she realized that she can love no one but Darcy. How they become united and understand the love for each other makes very interesting study. 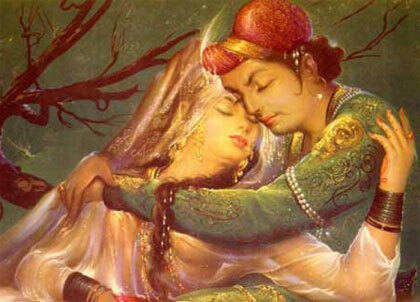 The love story of Salim and Anarkali is a story that every lover knows. The son of the great Mughal emperor Akbar, Salim, fell in love with an ordinary but beautiful courtesan Anarkali. He was mesmerized by her beauty and fell in love as soon as he saw her. But the emperor could not digest the fact that his son was in love with an ordinary courtesan. He started pressurizing Anarkali and devised all sorts of tactics o make her fall in the eyes of the young, love smitten prince. When Salim came to know of this, he declared a war against his own father. But the mighty emperor's gigantic army is too much for the young prince to handle. He gets defeated and is sentenced to death. This is when Anarkali intervenes and renounces her love to save her beloved from the jaws of death. She is entombed alive in a brick wall right in front of her lover's eyes. 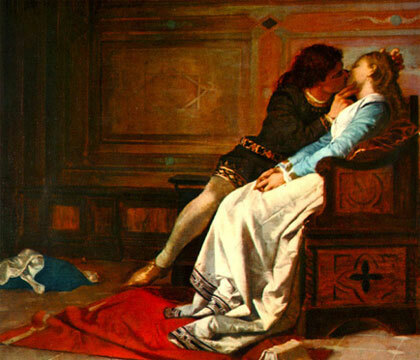 This love story is a famous legend in the history of America. Pocahontas, an Indian Princess was the daughter of Powhatan. Powhatan was the powerful chief of the Algonquian Indians in the Tidewater region of Virginia. Pocahontas for the first time in her life saw Englishmen in May 1607. She found John Smith most attractive and developed a liking for him. Smith was taken to the official residence of Powhattan and he was tortured. It was Pocahontas who saved his life from the attack of the Indians. Pocahontas then helped Smith to stand on his feet and Powhattan adopted Smith as his son. This incident helped Pocahontas and Smith to become friends with each other. Pocahontas after this incident made frequent visits to the Jamestown and passed on to the Indians messages of her father. John Smith after getting badly injured due to gunpowder explosion, returned to England. When Pocahontas made a visit to the fort, she was informed that Smith was dead. Sometime after, Pocahontas was taken prisoner by Sir Samuel Argall. Argall hoped to use Pocahontas as abargaining chip with her father Powhatan in effort to get English prisoners returned. During her captivity, she decided to become a Christian, taking the name “Rebecca” when she was baptized. A year later, she married John Rolfe. She made a visit to London, where he met his friend John Smith after eight long years and it was their last meeting. 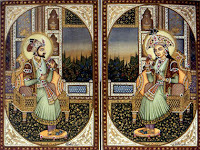 In 1612, a teenage girl, Arjumand Banu, married 15-year-old Shah Jahan, ruler of the Mughal Empire. 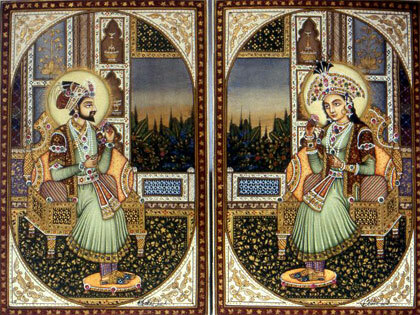 Renamed Mumtaz Mahal, she bore Shah Jahan 14 children and became his favorite wife. After Mumtaz died in 1629, the grieving emperor resolved to create a fitting monument. It took 20,000 workers and 1,000 elephants nearly 20 years to complete this monument - the Taj Mahal. Shah Jahan was never able to complete a black marble mausoleum he planned for himself. Deposed by his son, Shah Jahan was imprisoned in the Red Fort of Agra, and spent lonely hours staring across the Jamuna River at the monument to his beloved queen. He was eventually buried beside her in the Taj Mahal. This is a story about partners in love and science. Unable to continue her studies in Poland because universities did not admit women, Maria Sklodowska Curie traveled to Paris in 1891 to attend the Sorbonne. Known by the French "Marie," she spent every spare hour reading in the library or in the laboratory. The industrious student caught the eye of Pierre Curie, director one of the laboratories where Marie worked. Curie ardently wooed Marie and made several marriage proposals. They were finally married in 1895 and began their famous partnership. In 1898 they discovered polonium and radium. The Curies and scientist Henri Becquerel won a Nobel Prize for Physics in 1903 for discovering radioactivity. When Curie died in 1904, Marie pledged to carry on their work. She took his place at the Sorbonne, becoming the school's first female teacher. In 1911 she became the first person to win a second Nobel Prize, this time for chemistry. 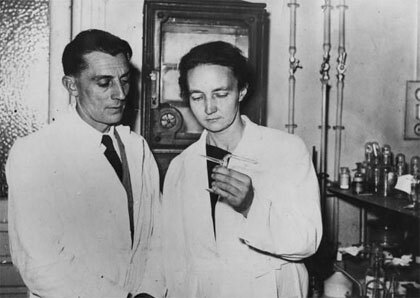 She continued to experiment and lecture until her death of leukemia in 1934, driven by the memory of the man she loved. This love story is about English royalty who mourned her husband's death for 40 years. Victoria was a lively, cheerful girl, fond of drawing and painting. She ascended the throne of England in 1837 after the death of her uncle, King William IV. 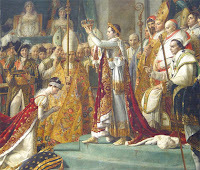 In 1840, she married her first cousin, Prince Albert of Saxe-Coburg-Gotha. 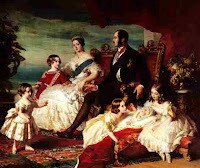 While at first Prince Albert was unpopular in some circles because he was German, he came to be admired for his honesty, diligence, and his devotion to his family. The couple had nine children. Victoria loved her husband deeply. She relied on his advice in matters of state, especially in diplomacy. When Albert died in 1861, Victoria was devastated. She did not appear in public for three years. Her extended seclusion generated considerable public criticism. Several attempts were made on Victoria's life. However, under the influence of Prime Minister Benjamin Disraeli, Victoria resumed public life, opening Parliament in 1866. But Victoria never stopped mourning her beloved prince, wearing black until her death in 1901. During her reign, the longest in English history, Britain became a world power on which "the sun never set." Did you know that you can create short urls with Shortest and receive $$$$ for every click on your short links.